THE GIVEAWAY IS NOW CLOSED. WE’LL DO ANOTHER GIVEAWAY SOON! I’ve been a very busy little crafter lately. I have been getting my Bramble Berry soap swap ready and sent off, then I made 25 samples for the June Out Of The Box Sampler (you can find them on etsy), then I sponsored 2 soaps for a 3000 fan giveaway. whew! 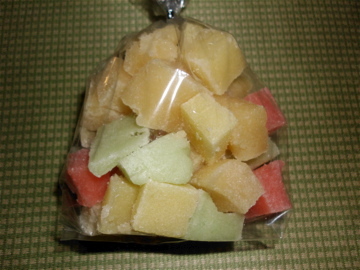 This is over 11 oz of sugar scrub cubes in a variety of floral scents. Take one or two in the shower with you, get them wet, smoosh them in your hand and use them to slough off any dead skin. This bag is unmarked but is made with a clear mp base (from brambleberry.com), white sugar, grapeseed oil, fragrance oil, and various colorants. So how do you win. Go to my etsy page: www.etsy.com/shop/soapyjoes look around click on some of my items, check them out, then come back here and tell me what you would get if you had $15.00 to spend. I will pick a random winner on Wednesday at 9pm (central time) and will post it here. I would get the White Tea and Ginger Soap, Summer Garden Soap & Vanilla lip balm! Summer Garden is one of my favorites! I would take all of your soap products and pay the difference…Especially the Everything but the kitchen sink. Aww Deb you are so sweet! I am a new fan and I would love to try your lip balms. The one I want to try the most is Coconut Lip Balm. Thanks for being a new fan Naomi! You are so welcome. I ❤ the sugar scrubs! I would do something sweet for my Hubs. He takes a bath every night! So the masculine scented Beau Bremmel soak would be perfect for him. As for me, I have never tried a lotion bar so I would go for the Meyer Lemon and Lavender lotion bar. Is it soap or lotion or both? It is a lotion. There is only beeswax, coconut oil, and avocado oil (no soap at all) 🙂 Your Hubs is a lucky guy if you would choose stuff for him. I would get some vanilla lip balm, meyer lemon & lavender bar, the kitchen sink bar (really cute). Thanks Heather! The Kitchen Sink soap is one of my best sellers! I would buy Carrot Cupcake bath soak, Black Amber and Lavendar bath bomb, Arabian Spice Linen/Room Spray and Everything but the Kitchen soap and owe you a dollar. Yep, that’s what I’d buy…thanks! Oh wow, the white tea and ginger and the capri olivo bath bombs would be first on my list, the yoga mat spray (what a lifesaver!) and the arabian spice soap! I would def buy some Bath Soak, Some Bath Bombs and I would love to try the room spray!!! Ty for the chance to win!! The room spray is amazing. Great for when you want to get rid of not so nice smelling odors. I would def get 2 Everything But bars & a Meyer Lemon lotion bar! The Everything Bars are a great way to use up soap scraps! I would get some linen spray’s & lotion bars! So excited to get my goodies I just ordered & try them out!